FAQ - PocketJIRA - JIRA application for the BlackBerry, Android and other mobile devices. 1.2 How much will PocketJIRA cost? 1.3 When will PocketJIRA Pro be released? 1.4 What about PocketJIRA for the other phones and devices (i.e. Android, Windows Mobile, iPhone, etc)? 1.5 What versions of the JIRA application server does PocketJIRA support? 1.6 Why is PocketJIRA trying to connect to www.pocketjira.com or www.pocketjira.net? 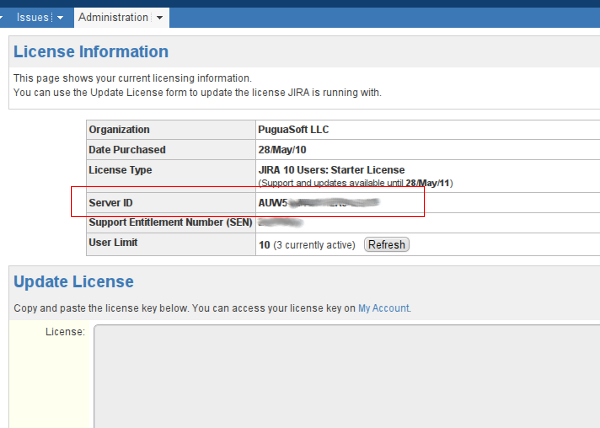 1.7 How do I find out what my JIRA Server ID is? 2.1 Which BlackBerry devices are supported? 2.2 I'm getting a "HTTP 413 - Request Entity Too Large" error message, what's going on? 2.6 Why do I see a blue border around PocketJIRA when using my Storm and Storm 2 BlackBerrry? 2.7 When using my Storm and Storm 2, I can't enter text because the keyboard is blocking the fields. 3.1 Which Android devices are supported? PocketJIRA is a JIRA application for the BlackBerry and Android. Versions for other mobile devices are planned for the future. With PocketJIRA, you will be able to view, create, and update JIRA issues, comments, follow workflows, and more from the palm of your hand. How much will PocketJIRA cost? There will be both a free and paid version of PocketJIRA. The paid ("Pro") version of PocketJIRA for BlackBerry will cost $5.99 USD. Like the BlackBerry version, the Android version will include a free ("Lite") version and a paid ("Pro") version. PocketJIRA for Android is still under development and thus, does not have a price set yet. When will PocketJIRA Pro be released? The BlackBerry version of PocketJIRA Pro is now available in the RIM App World and other mobile sites. PocketJIRA for Android is still under development. What about PocketJIRA for the other phones and devices (i.e. Android, Windows Mobile, iPhone, etc)? The porting over to the Android has already begun and we are now accepting beta testers. In the future, we plan on supporting Windows Mobile, and other Java/JME supported devices. There are currently no plans to port over to the iPhone since there are already solutions available for that platform. What versions of the JIRA application server does PocketJIRA support? PocketJIRA has been successfully tested on JIRA servers 3.13.x up to the latest 4.x versions. As long as the JIRA application server has the XML-RPC plugin installed and enabled, then PocketJIRA should be able to connect and successfully run against the JIRA server. To install and setup the XML-RPC plugin, please go here for instructions. NOTE: We plan to add support for JIRA servers 3.4 to 3.12.x in a future release. Why is PocketJIRA trying to connect to www.pocketjira.com or www.pocketjira.net? PocketJIRA connects to www.pocketjira.com or www.pocketjira.net to check if there is an updated version. If there is a new version of PocketJIRA available, you will be prompted with an option to go to the PocketJIRA download site. The auto-update feature can be turned off by going to the Settings page and deselecting Automatically check for updates. If you are running a BETA version of PocketJIRA, it needs a valid connection to www.pocketjira.com or www.pocketjira.net in order to check if the your current PocketJIRA installation is valid (i.e. it has not expired). This is a necessary procedure to ensure users are not running an old and unsupported version of PocketJIRA BETA. The public GA releases (i.e. non-beta releases) of PocketJIRA will not require this process. We value your privacy and we ensure you that NO information about you or your device is sent to www.pocketjira.com or www.pocketjira.net. How do I find out what my JIRA Server ID is? To get the Server ID of your JIRA instance, you need to log in as an Administrator then navigate to the Administration page. On the left-side navigation under System, click on License Details. You'll then be presented with your JIRA license details including the Server ID. PocketJIRA Lite for BlackBerry has been tested on devices running OS version 4.2.1 up to 5.0. This includes touch-screen devices like the Storm. PocketJIRA Pro for BlackBerry is only supported for non-touch devices running OS version 4.2.1 up to 5.0. Support for the Storm/Storm2 will be added in the future. PocektJIRA for BlackBerry may still work on OS versions older than 4.2.1, however, they are not officially supported. NOTE: If you're BlackBerry device is not supported at the moment, do not fear as we are trying our best to support as many devices as we can. If PocketJIRA is not working properly with your device, let us know and we'll do our best to support it. Send an email to support [at] pocketjira.com with as much detailed information about your device (e.g. model, OS version, wireless carrier, etc). I'm getting a "HTTP 413 - Request Entity Too Large" error message, what's going on? The error you're getting means that the request from PocketJIRA is larger than the BIS-B or MDS is willing or able to process. This can happen if you are trying to view a JIRA Issue or Comment(s) that is too large since there are limits on the amount of data that can be downloaded per connection. If this limit is exceeded, the BlackBerry BIS-B or MDS transport returns an HTTP 413 - Request Entity Too Large error. For BlackBerry MDS , this limit can be changed in BlackBerry Manager using the Maximum KB/Connection setting. In BlackBerry® Enterprise Server software versions 4.0 and 4.1, the default value is 256 KB and the maximum value for the setting is 1024 KB. In BlackBerry Enterprise Server software version 5.0, the default value is 1024 KB and the maximum value is 10,240 KB. Right click on the server name and click on Mobile Data Service Properties. In the General tab, under Flow Control, increase the Max KB/Connection value. Note: The maximum KB/Connection value is 1024. Highlight the server name and click on the Connection Service tab. Click the Edit properties option. In the General property, under Flow Control, increase the Maximum KB/Connection value. In the BlackBerry® Administration Service, on the Servers and components menu, expand BlackBerry Solution topology > BlackBerry Domain > Component view > BlackBerry MDS Connection Service. Click the instance that you want to change. On the General tab, in the Flow control section, in the Maximum data amount permitted per connection (KB) field, enter 1024. 5. Click Save all. For more information on changing this setting, refer to the appropriate BlackBerry Enterprise Server Administration Guide. For more information about the HTTP 413 - Request Entity Too Large error, visit BlackBerry Knowledge Base. Why do I see a blue border around PocketJIRA when using my Storm and Storm 2 BlackBerrry? Restart the PocketJIRA application (you may also need to restart the whole device). The blue border around PocketJIRA should now be gone. When using my Storm and Storm 2, I can't enter text because the keyboard is blocking the fields. All Android devices running Android OS version 1.5 and higher are supported by PocketJIRA. Devices running an older Android OS may still be able to use PocketJIRA, but we make no guarantees.